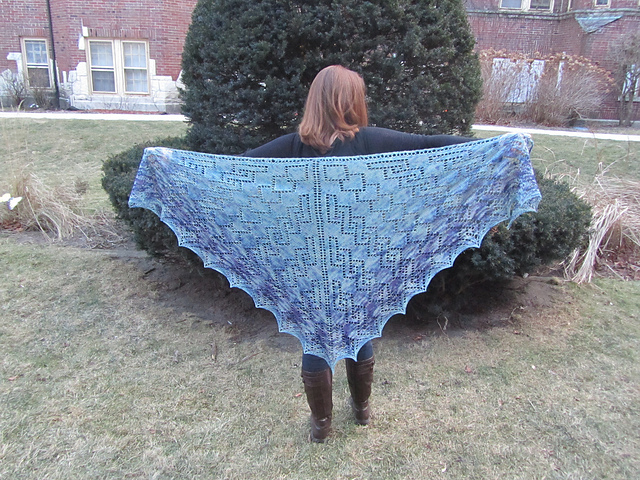 I am pleased to introduce my first shawl design, the Denise Shawl! The Denise Shawl was named after a small random act of kindness that left a lasting impression on me. The knitting community is full of people who are generous with their time and supplies helping their fellow crafters. This shawl is dedicated specifically to Denise, the stranger who gave me some stitch markers in a class at Vogue Knitting Live, but also to all other knitters who believe in helping out their fellow crafters. I also wanted this shawl to be an opportunity to use some of my hand dyed yarns. I dyed three commercially wound balls of KnitPicks Palette. To create the gradient of color in the sample, I dyed 3 factory wound balls of Palette Yarn (50 g each; see tutorial). To keep a single gradient across the shawl, rather than striped repeats, I switched strands from 2 balls at the beginning of every RS row. I carried the strands up one of the edges of the shawl, twisting them to keep the edge neat. When I had reached the darkest portion, I attached a strand of the 3rd ball and alternated strands on RS rows until the original two balls were used up. 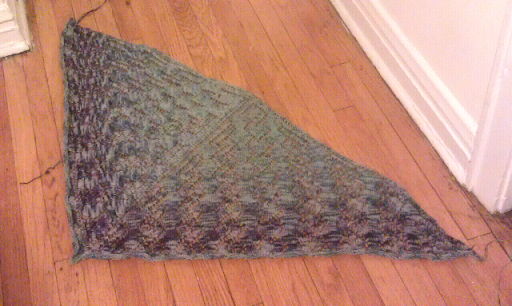 Denise is a triangular shawl worked from the center top down. All charts represent one half of the shawl and show only the RS rows. A garter stitch border 2 sts wide is worked the entire length of the shawl. 4 markers are used to separate the chart stitches (which are worked twice per row) from the center stitch and garter stitch border. US Size 7 (4.5 mm) – 24” circular needles. Notions: yarn needles, blocking mats and pins. Notes from Construction - These are the notes that I took down directly as I was knitting and writing the pattern. I am super excited to share with you my first shawl design! 231 yards / 50 g.
Since I was hand dyeing yarn for this project, I wanted to make sure I had enough to make as large a shawl as I wanted. 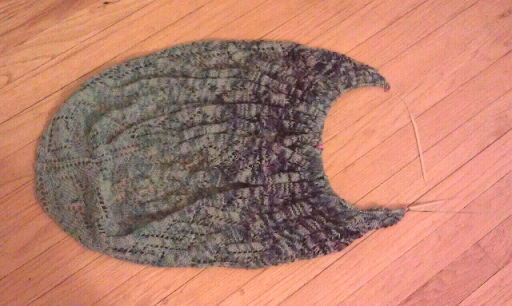 However, I also kept track of yardage so that you could make this shawl smaller with only 100g of yarn. Write for 2 sizes: S and L, where Small can be completed with 100g. I wound my balls with the darkest portion on the inside. 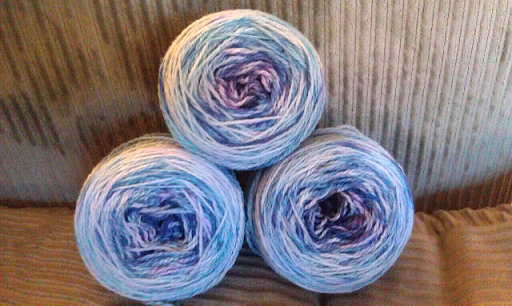 Knit with two balls of yarn, alternating. I have the third in case I run out of yarn or need a bit more for the end. (Starting with the two heaviest balls) - 96 g. to start with. (the last one is 47 g, which would be 143 g total… but the scale isn’t perfect so what can I do? 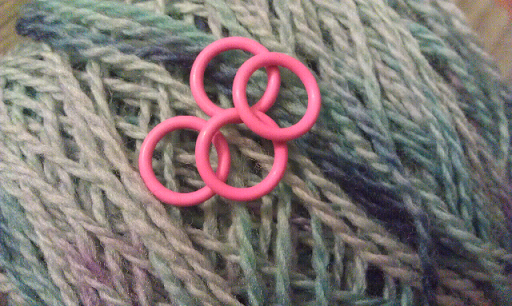 Using the stitch markers Denise gave me. I found that I had messed up a few of the garter stitch rows (at the end of WS), and that I needed to tear back to get it fixed. I’ve frogged small portions to fix mistakes before, but never at an edge where I was swapping 2 colors. After a few attempts, I got to a place where I don’t think you can even tell it has been repaired! After Chart A – 77 g remain. (19 g consumed for this first portion of the chart.) I checked the stitch count got 119, but should be 127 according to the chart + 5 extra stitches. BUT thankfully when I recounted I got 127 sts. Wahoo! After row 24 on Chart B 2x - 29 g remain. (This is the point where you would begin chart C for the small version.) With this measurement, I am committing to making the Large version for my sample. After row 3 (RS end) of B repeat 3, there are 15 g left. 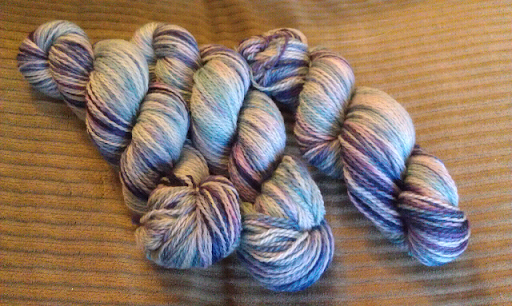 (This is equiv to the bindoff of the small shawl which requires 91 g/~420 yards.) This should provide the yardage estimate for the smaller shawl. 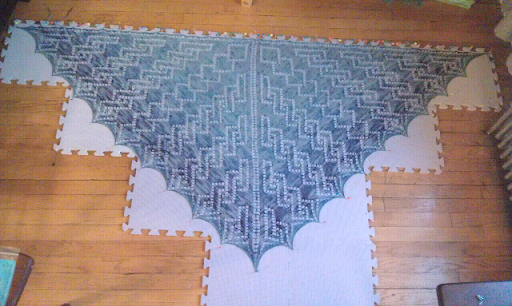 I counted after row 2, and there were 263 sts, the exact number I calculated for the end of the small shawl. I love it when numbers match up!